76 Gas is a chain of American gas stations that has been in operation since 1932. 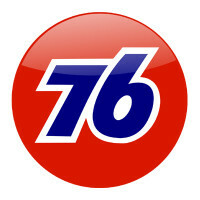 76 is a brand owned by Phillips 66 company that was once known as Union 76. The brand is sold at numerous service stations across the United States. The 76 brand’s trademark is a large orange ball with the number 76 written on in in bright blue and outlined in white. Ray Pedersen designed the 76 Ball in 1962. It is an iconic American gas station symbol that devoted fans have worked hard to save it from corporate redesign. Vintage 76 signs have become popular collectables and old 76 station artifacts are sometimes found in small museum collections. 76 Gas stations are typically located in dense urban areas or along major highways. The stores feature a wide variety of snacks and drinks. They also sell automotive supplies such as motor oil and windshield wiper fluid. 76 Gas stations typically hire employees in person at the store. Most 76 stations have their own name and jobs can be found by searching for that name. For instance, Starvin Sam’s is a 76 station and jobs at the station are often advertised at jobs at Starvin Sam’s. 76 Gas hires full and part time employees at their service stations. It also hires temporary employees during busy traveling seasons. How old do you have to be to work at 76 Gas? Check the age requirement for the state and position you are applying for. You must be at least 14 years old to work in the United States but many states have states have a minimum working age of 16 or 18. Some states allow minors over the age of 14 to work with a work permit. Work hours vary by station. Most gas stations open very early in the morning and are open until late in the evening. Some stay open 24 hours. Most service station positions do not include a benefits package. Some manager positions are salaried and may include a small amount of paid time off and the opportunity to purchase health insurance. Attendants are primarily responsible for operating the cash register and credit card machine. They are also responsible for cleaning the interior of the station including the register areas, drink areas, floors, windows and bathrooms. They also collect and take out the garbage and stock shelves and drink coolers. In some locations, they also prepare hot foods such as hot dogs and jojos. Some larger or busy gas stations have Assistant Managers. Assistant Managers help the manager take care of the day to day operations of the store. Typical duties include completing inventory and cash reports. They may also help the manager order merchandise and hiring and train employees. They sometimes open or close the store for the manager. When they are not performing managerial duties they work as an attendant. Gas Station Managers are responsible for taking care of the day to day operations of the store. They typically answer directly to the station owner. Typical duties include ordering merchandise, hiring and training employees, and completing labor and cost reports and inventory reports. They are also responsible for ensuring that all attendants are adhering to store policies and procedures. Managers are also responsible for opening and closing the store. Why should we hire you? This is one of the most commonly asked interview questions around. Focus on your experience, strengths and values. If you haven’t worked at a gas station before talk about other jobs you have had where you’ve operated a cash register or been responsible for stocking store merchandise. Tell me about yourself. This is your chance to highlight any background and experiences you have that are pertinent to the job. If this is your first job, talk about any responsible or healthy hobbies you have such as gardening or playing sports. What are your goals? Talk about your short and long term goals and try to relate it to the job and the company’s goals. Focus on goals that are related to the position. For example, if you are applying for a Sales Associate position talk about how you are good at anticipating customer needs and matching technological solutions to everyday problems. Each 76 gas station hires its own employees. You can find 76 Gas Jobs and apply for them online. First, search for the name of the gas station. For example, 76 gas is sold at Starvin Sam’s and Starvin Sam’s hires employees to work at the station. Be sure you are well groomed and wear clean clothes without tears. Casual clothing is appropriate but avoid sloppy looks or extremely casual attire such as flip flops and tank tops. Take a little time to prepare for the interview. Bring notes about your experience and strengths with you that you can refer to during the interview. Also bring any questions you have about the job to the interview so you remember to ask them. If your interview goes well, the hiring manger might let you know if you are hired on the spot. Be prepared to accept the position if it is offered to you. After the interview, thank them for considering you ask them how you can follow up on the hiring process. How to apply for 76 Gas job online? Follow the links below, to find a 76 Gas job application online, obtain a printable application for 76 Gas, and to apply for jobs at 76 Gas. Kwik Shop: For career opportunities, fill out the Kwik Shop online application. CITGO: Visit the job application for CITGO to apply today. BP: BP offers opportunities for both, beginners and experienced roles. Travelcenters Of America: For employment at Travelcenters Of America visit the application page. Royal Farms: See this page for jobs at Royal Farms.